Este estúdio bem equipado e com ar-condicionado está localizado no complexo Seawind on the Bay, na sofisticada área de Montego Freeport, com acesso total à praia no Hard Rock Cafe. O complexo está rodeado por dois grandes hotéis, o Secrets Resort e o Sunscape Resort, e fica ao lado do mundialmente famoso Montego Bay Yacht Club. A unidade está localizada a 15 minutos do aeroporto e a menos de 10 minutos do centro da cidade de Montego Bay. É também na mesma península do Porto de Cruzeiros, com fácil acesso a lojas, restaurantes e entretenimento. Perfekte Unterkunft und Einstieg für eine Karibik Kreuzfahrt! Perfekter Service, sehr nett eingerichtete saubere Wohnung! Ruhige, sichere Anlage mit Pool, Yachtclub und hardrock Cafe mit strand anbei fussläufig bestens erreichbar. Gesamteindruck bestens und die Vermieterin ist ausgesprochen nett und hilfsbereit! Sehr zu empfehlen! Everything about this unit and the owner was fantastic and I echo all the comments in the other 5 star reviews. I was there for 4 nights earlier this month on my first visit to Jamaica. Petronia was there to welcome me and show the unit. It was still two hours before check in and I was prepared to sit by the pool reading but the unit was ready for arrival. I had asked in an email about nearest grocery store and she set a time later in the day and drove me there and waited while I shopped! Throughout my few days there she was very helpful with information and arrangements including transport to my next stop in Jamaica. All in all a wonderful person and host. I did not have a rental car but cabs were plentiful outside the front gate and at the resort across the road. However I was primarily content to enjoy the facilities at the complex or the beach at the Hard Rock Cafe. Immediately next to the complex is the Montego Bay Yacht Club. The food and atmosphere there made for very enjoyable meals. Also ate at the Hard Rock. Overall, the complex was quiet and well maintained with a manager and staff there and a guard at the entry gate. It is a mixture of permanent residents, seasonal owners, long term rentals, and short term such as this. The pool is a short distance from the unit. As mentioned by others, the unit itself has a very nice decor and layout with a full kitchen. Bathroom was a reasonable size with a large shower area. Petronia has supplied it very well in the kitchen and throughout the unit with numerous small touches such as amenities in the bathroom and some welcome items in the refrigerator (beer, water,soda!). There is a lockbox at the entrance that can be used for the key when going out to the beach or pool or upon arrival if she isn't immediately available due to her job. I was impressed that in addition to the standard smoke alarm, there was also a carbon monoxide detector. WiFi was strong all week and although I didn't watch tv, I checked and the cable system has a large number of channels including the major US networks.This is an end unit and as a result. it has it's own small patio area in front. with a small table and chairs. It is nicely screened by bushes and a stairwell creating a nice sense of privacy. As soon as I submit this, I'm sure I'll remember more that I wanted to comment on. But to wrap up, it is an excellent choice and Petronia is the perfect host. I just wish I had stayed longer. I look forward to returning! Comfortable studio apartment with pool in beautiful, quiet surroundings. This Montego Bay Studio was just what we wanted - a great place to relax, refresh and rejuvenate following other travel so we could attend our nephew's wedding nearby. But the studio was just the beginning. Petronia, the property owner, went above and beyond in MANY ways: providing transportation for us to and from the airport, providing a local phone to use; some beverages were available in the refrigerator and coffee and tea in the cupboard. When the WiFi wasn't working she quickly called the provider to have the service reset and then it worked perfectly. Petronia was very friendly and helpful - would have helped us get groceries, too. The location is super - near the Hard Rock Cafe and beach with a pass provided to use their facilities. The Yacht Club has great food and is right next door - and you have a pass key to gain access when you want. We were so pleased and will contact Petronia if we return to Montego Bay! 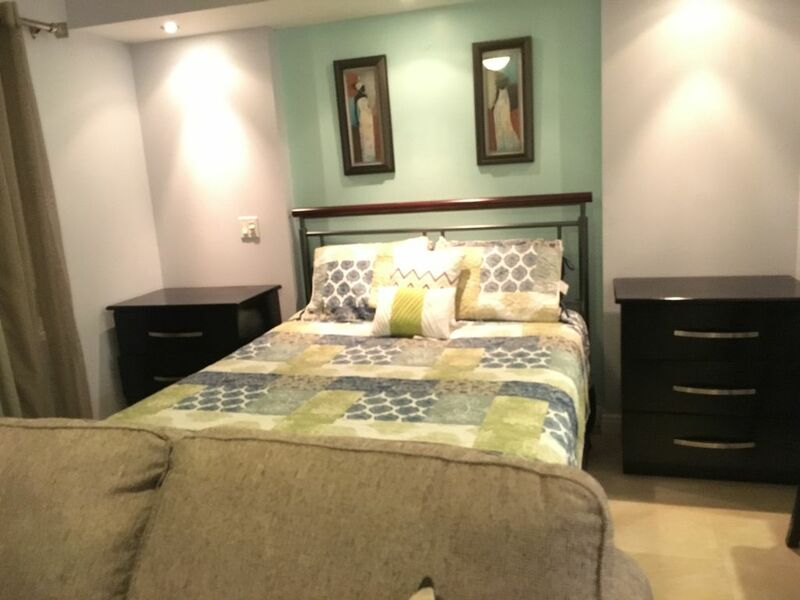 Amazing stay in this beautiful studio apartment! First impression, nice, quiet secured community located by the boat docks. Property kept very clean, beautiful pool and bar area, lots of parking and easy access to transportation resources. But the hospitality of Petronia was unmatched! She accommodated us very well, apartment was just as beautiful as the pictures, all of the essentials were provided and they were of very good quality. She was already at the apartment once we arrived, made us feel welcomed, made sure we had everything we needed and always made herself available to communicate with. I would highly recommend this place to others and I will definitely be back. Thank you Petronia! We had a wonderful stay! The people in the complex were welcoming and so much fun! The house was everything we needed. It was clean well stocked and comfortable! I can't wait to come back! Este apartamento está localizado na área do Freeport de Montego perto do terminal de navios de cruzeiro. O complexo está localizado à direita na água com uma bela vista do navegador. Do outro lado da estrada é o acesso à bela praia do Hard Rock Cafe, que também tem uma adorável piscina e um restaurante e bar.